We're looking forward to participating in CONTROLS-CON 2019 being hosted by our friends at Cochrane Supply & Engineering. 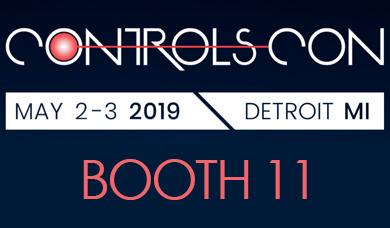 CONTROLS-CON will take place May 2nd and 3rd, 2019 at the MotorCity Casino Hotel in Detroit, Michigan. The event showcases the latest innovations in Building Controls and the Internet of Things (IoT) in commercial and industrial buildings. "CONTROLS-CON is a great opportunity for systems integrators to learn about the latest technologies being developed for the industry," said Harpartap Parmar, Senior Product Manager. "We have several new products being released in 2019. The CONTROLS-CON attendees are going to be some of the first customers to see these new developments." The BAScontrol22C is a BACnet/IP server and also provides BACnet/IP client capability which allows the user to read and/or write points served up by devices on the BACnet internetwork. The BASstat is a BACnet-compliant communicating thermostat that is BTL Listed to ensure effortless integration into BACnet MS/TP (EIA-485) networks. BASstat thermostats are suited for single or multi-stage heating, cooling and ventilation binary output control applications such as RTU or AHU. The EIWR brings WiFi capabilities to our Skorpion series of IP routers, which ease the integration of new machines into the existing network. The EICR joins the VPN router family, expanding the capabilities of the RemoteVPN service. The RemoteVPN is a service offered by Contemporary Controls that allows systems integrators remote access to systems from the convenience of the systems integrator's home or office. The use of RemoteVPN service, along with our VPN routers, eliminates the need for a Static Public IP address providing considerable saving. The BASview3 is a stand-alone, web-based supervisor for BACnet and Modbus systems that provides trending, alarming, scheduling, graphics/dashboards, and doesn't require a license on devices/points. And finally, one of our oldest and most popular BASautomation products, the BASrouter, now provides built-in BACnet diagnostic capabilities with visual analytics that include an MS/TP status table, routing status table, network error counts, and traffic statistics. The new features allow the integrator to install robust BACnet networks with rapid troubleshooting capabilities that easily identify network issues. Learn more about these products at CONTROLS-CON 2019.